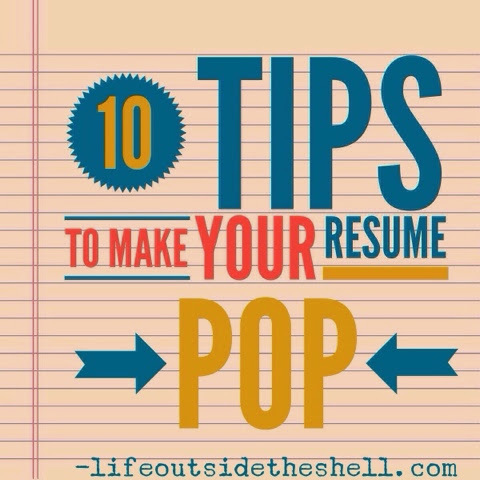 Life Outside the Shell: 10 Tips to make your resume Pop! My husband and I are business owners and have seen many resumes over the years. I had an idea recently to start jotting down common mistakes I see that caused me to never open some of the resumes. Some of these things are common sense, but many people just don't take the time to think about the first impression they are making. So if you are job hunting, or just need a good laugh, this post is for you! I know in this day and age of texting it is so easy to type something and click send. But misspelling words, especially if it's in the email title or on your resume, almost guarantees your resume will get overlooked. Please don't send an email with the title "I am intresed in this job". If you aren't sure how to spell something look it up in the dictionary, I promise you that extra minute to be accurate is worth it. 2. Get a legit email address. babygotback123@yahoo.com is not a legit email address. A weird email address speaks volumes of a person. If you don't have something simple just create an account for sending resumes. You always want to look professional on every aspect of the application. 3. Keep your name consistent. This is especially important for those of us who have a maiden name or alternate name(i.e. your name is Olivia but you go by Livvy). It's all about making an impression so you want the potential employer to know you by one name not trying to figure out who you were. Make sure your email address(if possible), cover letter, resume and name you use in interview all line up. 4. Put your name in front of the employer at least 3 different ways. I can't tell you the lasting impact it makes on me when I have someone submit a resume via email, then I get a message from the staff that they called about the position, then they email OR hand write(gasp) a personal note thanking me for the interview. Again, the name consistency helps ensure you get proper credit for doing all those things. 5. Address the potential employer formally. It is not professional to submit a job application with the message in the email stating "hey! I heard you are hiring, would love to work with you guys!". I see this so much these days and it really is a turn off because it makes me question how professional you will be in the office and with our clients. 6. Be careful with social media. More and more employers are checking social media to see what kind of presence you have there. Be careful of the type of pictures you have as your profile pictures and if possible put everything on private or even hidden. 7. Check the length of your resume. The general rule of thumb is that your resume shouldn't be longer than a page. I know we all want to list every wonderful thing we have ever done but you need to know your target population and the job you are hoping to acquire. Employers will not "dig" through long and wordy resumes so the things that should have been highlighted will just get completely lost. 8. Know the company you are applying to and send a cover letter. This goes along with the length of the resume but can be used in the interview as well. Know what the company does, the type of people they like to hire and their target market. You will use that information to highlight your strong points on your resume, on your cover letter as well as in the interview. A cover letter lets the employer know you took the time to personalize your application to their company. You would be amazed at the number of people who come in for an interview who don't even know what the company does. Most companies have clear instructions on the hiring site how to apply for a job. When I receive an email asking me questions about how to do it or just completely leave out things I requested I delete their resume without even opening it. If you aren't able to read simple instructions to apply this shows you may not be able to perform simple tasks within the office. Last, but certainly not least, pray! Pray over your resume and cover letter before you send it. Ask the Holy Spirit to show you what needs to be taken out or added. Then pray God opens doors only He can open and close the doors that need to be closed. These are great tips!! I wish they taught those life skills in school. My husband is a hiring manager at Passages and it's shocking how many resumes he receives where people have used all lowercase letters throughout their resume, or will skip required portions of the application.